After time showrooms can get a little cluttered and tight. It only makes sense after a few killer sales and great new product releases. But, if things get too tight, customers might find it hard to navigate through all the fabulous product. If possible, loosen your floor just a little and your numbers will jump. It has been proven that when your vignettes can breathe and customers can stand back to imagine it in their house, they are more likely to find something they like and buy. Accessories are the jewelry of the showroom, and little bit can go a long way to make your showroom sparkle. Start with a piece of artwork that will coordinate in both color and style, but make sure it’s size appropriate. Next add a couple of tabletop accessories like a vase, photo frame and tray to compliment the artwork and furniture group. These items, when thoughtfully selected can emphasize any group’s special features, colors, and patterns while dressing it up a bit. It’s also a great way to get an add on sale! 3. I Saw the Sign. Weekends and sale days can get pretty busy, so let your signage help by showing customers useful information. Showroom signage serves multiple functions. It can give customers directions on which way to go, provide useful facts or information on product, and even advertise sales. Signage is also a good way to repeat a message or instill brand awareness to customers without verbally reminding them. The right signage can help make a sale by educating customers on product options, hidden functions, quality features, and more. Check us out online to see more examples! Pick a small area in your showroom and change the colors of the walls if needed, or reset the furniture with a new assortment. Furniture is a fashion industry and is constantly changing. The colors we choose to accent the walls with in a showroom should complement your current furniture selection, so it might be time to update your paint colors. Also, a simple rearrangement of a couple of furniture groups can make customers think they are walking into a new store. Seasonally changing out key displays will also help customers discover new product as well as rediscover older product in newer location. After time product can spread out and a gallery might lose its effect. 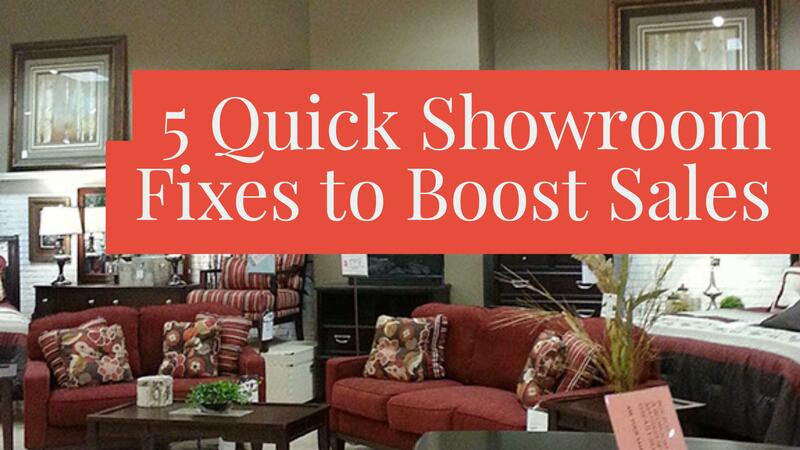 Help the flow of your showroom by regrouping like products together. Bring your reclining groups together in a designated area, or your high end traditional groups together. It has been proven that when like items such as motion sofas are together, sales tend to increase because all options can be found in the same area. It also allows customers to compare between products and gives you the chance to upsell. Showrooms with organized galleries or designated departments are less confusing for customers and easier to navigate.